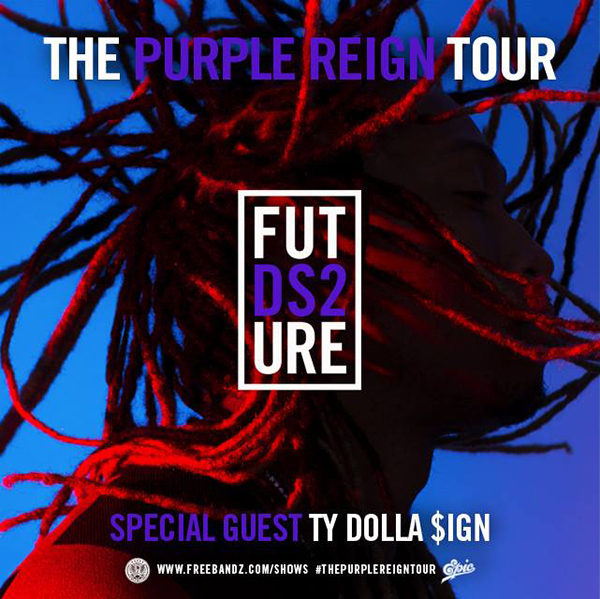 Future has announced the “Purple Reign” tour with opening act Ty Dolla $ign. The 22-date trek kicks off on Feb. 17 at the Orpheum Theatre in Madison, Wis., making stops at New York City’s Hammerstein Ballroom, Atlanta’s Tabernacle, The Fillmore, here in DC and Los Angeles’ Hollywood Palladium. Future released his solo album DS2 and his collaborative LP with Drake, What a Time to Be Alive, both of which topped the Billboard 200. Tickets will be available for pre-sale starting Dec. 10 at 10 a.m. on Freebandz.com. This entry was posted in Entertainment, Live Entertainment. Bookmark the permalink.